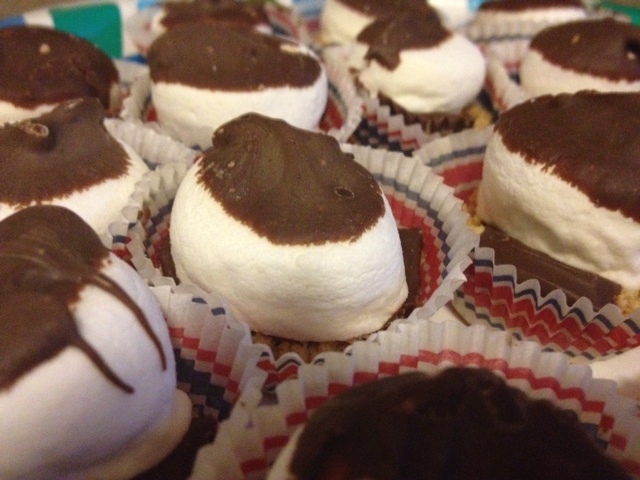 S’mores Cups | Om nom nom! Preheat oven to 350°F. Place graham crackers into a large resealable plastic bag. Finely crush into crumbs. Combine graham cracker crumbs, powdered sugar and butter in small bowl. Place scant scoop of crumb mixture in each cup of mini muffin pan. Press crumbs to form shallow cups. Bake 4-5 minutes or until edges are bubbling. Meanwhile, break two of the candy bars into rectangles. Remove pan from oven; place one rectangle into each cup. Cut marshmallows in half crosswise using shears dipped in cold water. Place one marshmallow half, cut-side down, into each cup. Return to oven 1-2 minutes or until marshmallows are just slightly softened. Remove from oven to cooking rack; cool 15 minutes. Carefully remove cups from pan. Cool completely. Break remaining candy bars and place in small bowl. Microwave on HIGH 1 minute-1 1/2 minutes or until melted and smooth, stirring every 20 seconds. Dip the top of each marshmallow in melted chocolate. Turn top-side up and let stand 40 minutes-1 hour or until set.